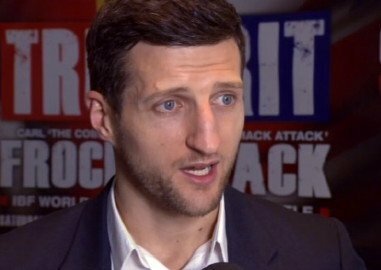 What’s next for Carl Froch: Rubber match, Resume, Rematches or Revenge? Carl “The Cobra” Froch has been sounding a lot like Floyd ”Money” Mayweather in the days following his huge payback win over Mikkel Kessler, which was broadcast by HBO in the United States, and Sky Sports PPV live from the O2 Arena in London, England. In so many words, Carl Froch and his promoter Eddie Hearn are saying, “all roads lead to Carl Froch”. Like Floyd as well, he says he has 3 or 4 major fights before he calls it a day. All jokes aside he does have plenty of option on the table. One is the rubber match with Mikkel Kessler. Another is a resume booster with a Bernard Hopkins fights. A Rematch with the winner of Jean Pascal vs. Lucian Bute Fight would be a good business move. And last but not least a revenge opportunity with Andre Ward. Business wise all 4 fights make sense for Froch and his promoter Eddie Hearn of Matchroom Sports. Putting my promoters cap on for a moment, I feel Froch has to be very careful on the opponents he chooses to finish his career. Or rather the order in which he chooses to fight them. If I were Hearn I would do everything in my power to steer Kessler and his Sauerland Promotional team to do a rubber match later this year in a previously reported neutral site like Germany. His fighter is on fire and has figured out how to secure a second straight win over Mikkel Kessler. The saying “strike while the iron is hot” comes to mind. The definition is to do something immediately while you a good chance of achieving success. Froch has the power jab, chin, and work rate to win a third and deciding fight versus Mikkel Kessler. Kessler said it himself after the fight that he couldn’t deal with the constant pressure. He even managed to hurt Froch twice but that still wasn’t enough to stop Froch from coming forward with reckless abandonment. Mikkel showed he is on down side of his career and a third fight in the same year will make the slope all the more slippery. It could do similar if not more PPV buys on Sky Sports, generate another profitable gate, and will be a relevant fight that draws interest from networks across the world. According to Eddie Hearn, he’s aiming by year’s end for George Groves to land a big enough fight in order to raise his profile to make him a viable opponent for Froch. George would be a good fight to squeeze in between a third fight with Kessler and a Hall of Fame resume builder fight with the newly self proclaimed “Alien” Bernard Hopkins. He could wait on George Groves and fight Robert Stieglitz in 2014, which would add another worthy name to the modern day throw back style legend that Froch has created with his string of fight after fight versus solid to elite talent since 2008, with only Yusaf Mack being the stay busy fight. The key to securing a fight with the legend of longevity Bernard Hopkins is bringing him to the O2 Arena in London, something he already has stated he is willing to do. Make no mistake it’s a very tricky and tough fight. BHOP may just have enough tricks in his (Snake) bag to charm or suffocate the Cobra. We know that Hopkins has had some problems with high volume guys but only when that trait is matched with speed, something Carl Froch doesn’t have an abundance of. Without going into much detail about the matchup, it is a winnable fight for him. With Hopkins low punch output along with him being in enemy territory, the Cobra could snake out the close win very likely a split decision win by simply out working “The Alien” or stealing the close rounds like he did with Kessler last Saturday. If Hopkins can get the short end of the stick in the states, like many thought versus Jermain Taylor, it’s safe to say he could lose a competitive fight to Froch in his backyard. The biggest fight of them all is Revenge Rematch with Andre Ward, a man that is universally known as a Top 5 Pound for Pound Fighter. That fight is there any time for both fighters. Froch would be best to wait and keep trying to improve. If he were to get to this fight without losing that means he would have face a counter punching Hopkins. Great practice even if it’s not the same speed or athleticism as Ward. Many scribes and fans alike have talked about the recent improvement that Carl Froch has made. He is not as limited as he can and has looked at times trying to land the one perfect shot. His biggest improvement may be playing to his strengths for his game plan, in turn giving him the best shot to win with the assets Froch posses. This would be a good time to fight either George Groves, who by 2015 surely should be a big enough of name across the pond to make a British fight that would be a good payday. Or jump right into a rematch with winner of Jean Pascal vs. Lucian Bute Canadian Super Fight, something Froch could do before a Benard Hopkins fight. By this time if Carl Froch still hadn’t loss a fight since his first fight with And Ward, he would be already Hall of Fame bound, whether fans in this country agree or not. What better way to end you career? Having a shot at revenge in what potentially would be his only loss not amended. Either way it won’t be next that seems clear. Ward will have been out for at least a year when he returns this fall. The earliest is next summer so they can do a Stadium fight according to Hearns, who didn’t seem too interested in talking about a revenge fight with Andre Ward at the post fight press conference. I could see this fight happening in summer of 2015. If Froch still has the fire burning in his belly to give it his all in camp and fight night, he could make a pile of money and secure his legacy. You are here: Home / Boxing News / What’s next for Carl Froch: Rubber match, Resume, Rematches or Revenge?